Get in shape, August will not wait! If you are anything like me, you are terrified that summer holidays are approaching fast and your burger diet will start showing through your swim suit. History has shown that if any fitness activity is bound to start, summer is the season! On the other hand, a gym comes with a monthly fee that normally goes through the roof. So if (like us) you save your extra penny for your holidays, read below some of the best free sports activities in London that will not break the bank! Special Offer: Get Free 3-Day Gym Pass at any Fitness First gym. Running on your own can be a bit boring, right? I mean, I love running on my own, across the river, enjoying the views and some quality time with myself; but running with other people is always more interesting and helps to keep you motivated. Those guys at Sweatshop Running Community run together all year long. They organise beginner runs and faster runs for more experienced athletes and have added a few perks to keep you motivated. For example after 5 runs, you get a FREE adidas Sweatshop Running Community technical t–shirt (worth £14.99). Not bad huh? Find your closest Sweatshop running club here. Similar to Sweatshop but run by volunteers, parkrun organises –exactly as its name suggests- runs in various parks every Saturday morning. 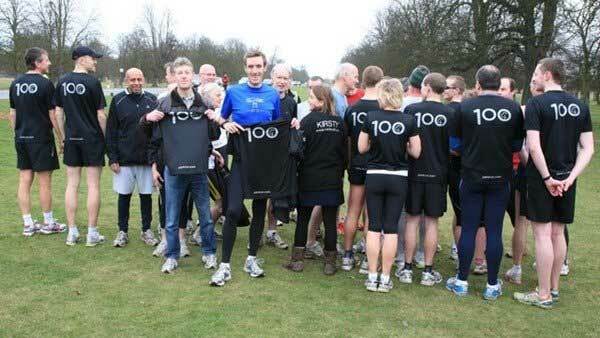 Parkrun is also a great opportunity to meet people living close to you! 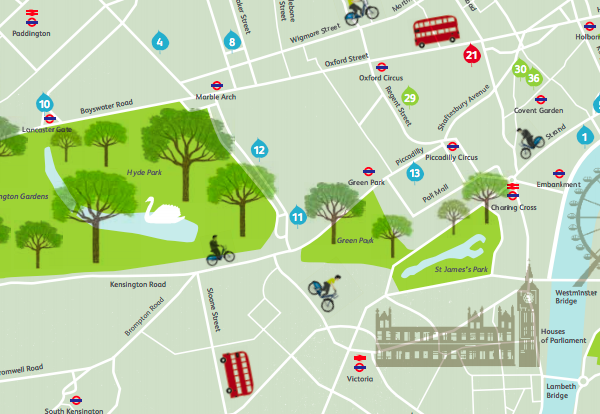 You know it, your neighbour knows it and tourists know it: cycling in London is cool and with so many different cycle routes it is never boring! If you don’t own a ride you should know that Santander Cycles are easy to use and the most economical solution to cycling for those of you who do not yet know if they are committed bikers. Just hire a bike, ride it where you like, and return it to any docking station, ready for the next person. Yoga is gaining new fans every day! 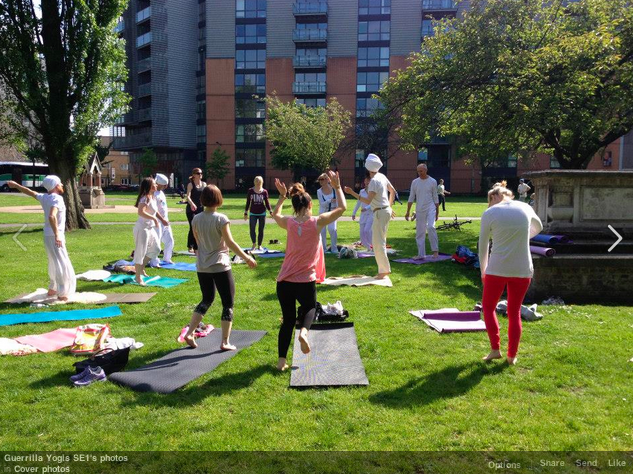 Guerilla Yogis set a date through meetup and meet every Saturday (weather permitting) in Southwark Park for a free yoga session (donations welcome!). Sometimes, the plan changes so you need to like their Facebook page for latest news. 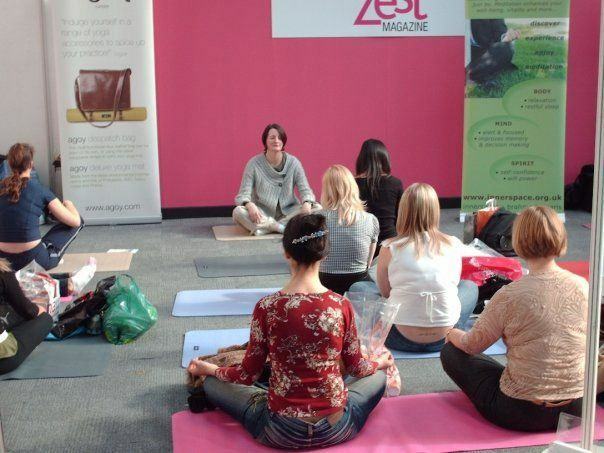 You cand find more free yoga classes through our article ‘Free Yoga in London‘. So yes, meditation is not – strictly speaking- a sports activity. But it helps you recharge your batteries and get rid of negative emotions – as much as half hour basketball would do and more; that’s why it is included in this list. Inner Space organise free sessions in Covent Garden and the City but you need to book in advance! If cardio is not your thing, how about some weight exercises? You can visit any of the free gyms scattered in parks around London. If the weather is not encouraging, don’t forget that a lot of gyms offer free taster sessions or weekly passes. Finally, if you need some girl power, trust our Kelly and sign up for Nike’s Training Club. Good luck and tell me all about it! Read more posts by Afroditi.